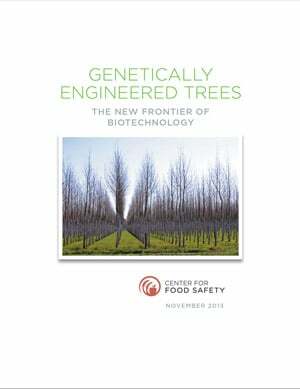 Genetically engineered (GE) trees are a new frontier of plant biotechnology. These trees are promoted as the new green solution with claims that they will save native forests, protect wildlife and biodiversity, mitigate climate change, and more. But behind these false promises is a very different reality. Instead, trees are being genetically engineered for a range of purposes aimed to accelerate large-scale, industrial monoculture tree plantations and increase profits for biotechnology companies as well as paper, biofuel, lumber, and energy industries. Already, tree plantations of eucalyptus, poplar, oil palm, and pine trees are widely planted around the world and have a legacy of extending deforestation, polluting ecosystems, and often violating human rights in local communities. Poised on the precipice of adopting this novel, unregulated, and untested technology, this report serves as a primer to GE trees and explores the troubling short- and longterm ecological and socioeconomic dangers that transgenic trees pose. An overarching theme of this report is that, fundamentally, GE trees—and tree plantations—extend and exacerbate an industrial, chemical-centric approach to agriculture that has already polluted soils, waterways, and air; diminished biodiversity; and emitted greenhouse gases. As with GE crops, monoculture GE tree plantations will require repeated and widespread dousing of chemicals to eliminate pests and plant diseases. But, eventually, these pests and plant pathogens become resistant to chemicals and require more toxic brews.